Yesterday saw the beginning of #EveryoneDeservesPrettyKnickers week which is being run by Susan from Measure Twice Cut Once patterns. I've met Susan a few times at Sydney Spoolettes meet ups and we also chat a bit on social media. She's always been SO helpful to me with my sewing woes so when she announced she was collaborating with Sew Make Create to run knicker making workshops I signed up ASAP! Susan is a professionally trained fashion designer and has years of experience in the industry. She really knows her stuff...and what's even better (for me that is) is that she's SO willing to share her knowledge. Susan in action - adjusting my knickers into a pair of "bigger gal undies"
For the class we were working on the Charlotte Knickers - a pattern released by Susan earlier in the year (she's designed and released a range of six knickers -- so hop over to the shop and see if there's a style that takes your fancy). I decided to use some cotton voile fabric for my pair that I bought from...you guessed it, The Fabric Cave. Yes, these knickers are made from a woven fabric rather than the stretch fabric so common in store bought lingerie. The knickers are cut on the bias which makes gives them the necessary stretch needed across your caboose. We all had a bit of a giggle at the difference between the un-elasticated pair and elasticated pair of knickers. I've not yet finished my knickers...too much talking and not enough sewing (though the photo below does prove we all sat the machines...even me)! I just need to stitch the elastic to the legs and then top stitch all the elastic down to encase it in the fabric. Before that I just need to get over my fear of sewing elastic using my overlocker at home! Oh, and it's not a sewing class at Sew Make Create without the ever watchful Pepper supervising the class! Susan has a knicker sew-a-long starting on her blog tomorrow - so there's still time to whip up your own pair of knickers during #EveryoneDeservesPrettyKnickers week using one of her patterns. 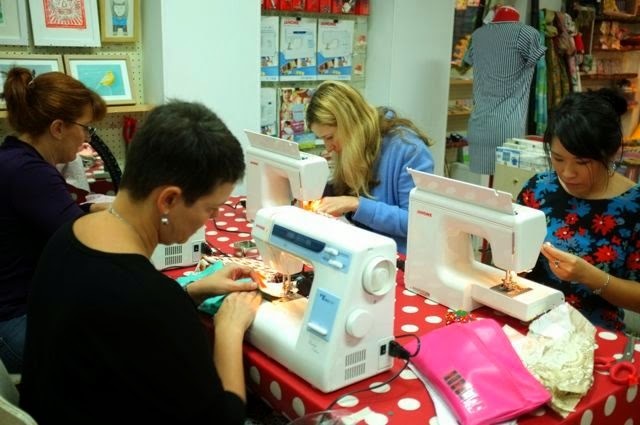 There is also another class coming up at Sew Make Create very soon - I highly recommend it! Looks like a great class and will be interested to hear how the woven fabric wears. How cute is the sewing supervisor! Such a cute supervisor. Looking forward to seeing your 'results'. Everyone does deserve pretty knickers. Susan is a walking encyclopaedia of sewing knowledge! I have never delved into making knickers, I might have to give it a go, they seem good to use up scraps. I'll be interested to see how the fit is being a woven. I would be concerned about the gathers showing through my outfits and looking like I was wearing nappies!! The finished pairs I saw looked super cute and they wouldn't show if you were wearing them under jeans or a fit & flare dress. Probably avoid wearing them with your body-con dress collection though! Super cute supervisor! Susan was a GREAT teacher...so calm and eager to share her knowledge. I just need to be brave and hit the overlocker to finish my duds. Soon. I hope! Thank you for your lovely review of the class, am so glad everyone learnt some new techniques and had fun too!